On Tuesday, President Donald Trump addressed a joint session of Congress, touching on a number of subjects. One subject was the creation of private sector jobs for American workers. During his speech, he listed companies that have announced investments and job additions in the last few weeks. “Since my election, Ford, Fiat Chrysler, Generall Motors, Spring, Sofbank, Lockheed, Intel, Walmart and many others have announced that they will invest billions and billions of dollars in the United States and create tens of thousands of new American jobs,” he said. 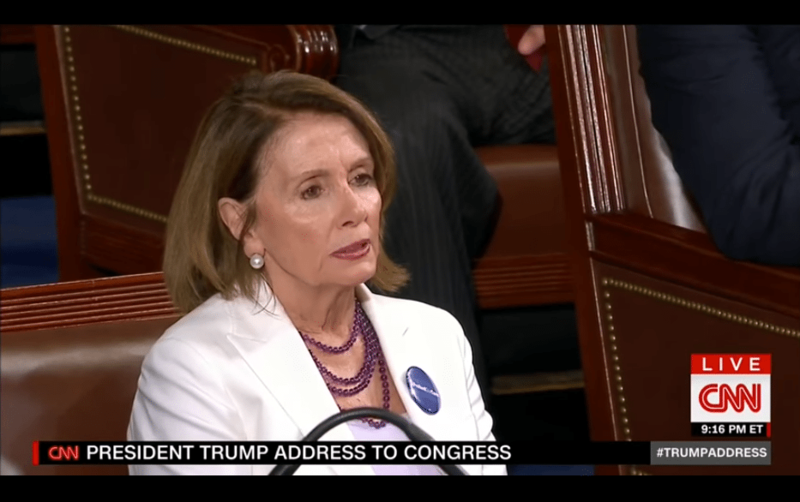 Many stood to applaud, but House Minority Leader Nancy Pelosi refused to stand or applaud. Nancy Pelosi is the face of the Democrat Party. “That look is pretty much a metaphor for what’s happened to the Democratic Party in the last couple of elections,” Twitchy said.